When pieces of music technology equipment are required to work together, a means may be required to synchronise them. The MIDI standard includes a group of single-byte messages called System Real Time (SRT), four of which are concerned with synchronisation (Clock, Start, Continue and Stop). The Sync24 system was introduced by the estimable Japanese company, Roland (who have both a UK website and a US website). The system was subsequently adopted by a few other manufacturers, but was then largely superseded by the sync facilities of MIDI. Sync24 is popularly known as `DIN Sync', because it uses the round five pin DIN connector, coincidentally the same as is used for MIDI. Although they use the same type of connector, you should never connect MIDI sockets to Sync24 sockets. Note: pin 4 in the sync cable can safely be connected, even though it is not used. The Philip Rees MDS MIDI to Sync24 Converter listens to an incoming MIDI SRT clock stream and generates a corresponding Sync24 (DIN sync") format output. The MDS appears as a tempo slave to your MIDI system, and is a tempo master in Sync24. When you have installed your sync converter, your Sync24 device(s) should start, play in time, and stop automatically, by remote control from your MIDI master equipment. 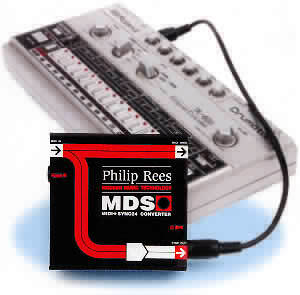 The MDS has a MIDI In port, for which a handy MIDI Thru socket is provided. Because it has a proper mains (ac) power supply built in, it is able to put out correct Sync24 voltage levels with full output drive capability; it is also able to power thorough microcontroller-based conversion, which can operate correctly with complex received MIDI and fussy slave devices! The MDS has a single Sync24 Sync Out socket. The signals have good drive capability, and we have not found any compatibility problems. The Sync24 output is able to drive several Sync24 inputs in parallel. To make use of this you will probably need a special multi-drop cable assembly. Some Sync24 devices, notably the MC202, have a built-in fan out capability to drive extra slave units. Certain MIDI master devices, especially computers, can issue MIDI clocks in a shockingly irregular manner, with clocks sometimes being bunched up into bursts. Most Sync24 (DIN sync) devices have a maximum tempo of three-hundred-odd bpm and they expect clock pulses to come regularly. If the pulses are too short or too close together the Sync 24 device may miss them and fall out of step. The MDS has noteworthy Start, minimum-pulse-width and maximum-tempo logic routines. In this way, it is able to maintain optimum slave timing, even with very erratic MIDI masters. As well as regular Start and Stop commands, MDS implements the MIDI Continue command and the Sync24 feature. Compatible Sync24 devices, such as the MC-4, should resume correctly via the MDS. Some devices, including the MC-202, respond to a Continue by resuming from the beginning of the current `measure'. You may be able to arrange that your master MIDI sequencer always restarts from the beginning of a measure. You can probably manually set both sequencers to start at the same measure. Alternatively you could always to restart the sequence from the top. The Continue facility is not included on some Sync24 devices (notably TB-303 and TR-606). When the facility is omitted, the Continue command will cause the slave to start the sequence from the very beginning. In the diagram (left), a normal MIDI cable connects the MIDI Out socket of the computer to the MIDI IN of the MDS. The computer has been set to run off its own internal clock. Also, MIDI Timing Clocks Out has been enabled in the computer sequencer program. The beat lamp should be flashing, which indicates that the MDS is receiving a stream of MIDI clocks from the computer. The MIDI THRU output of the MDS is connected to the MIDI In on the synthesiser. The SYNC OUT port of the MDS is linked to the Sync port of the old drum machine with a suitable DIN to DIN lead. The Sync24 port of the drum machine should be set to Input mode. The suitable DIN to DIN lead is a pin-to-pin cable with pins 1, 2, 3 and 5 connected. It is not obligatory that pin 4 is not connected, this pin is simply not used. However, you do need a lead with pins 1 and 3 connected, so a dedicated MIDI cable may not work. You can use a tape recorder (that is, not reversal, mirror, or cross-connected) stereo DIN to DIN audio lead. When the sequencer is running, the computer will transmit Channel Voice and SRT messages. These arrive at the MIDI IN port of the MDS, and are duplicated at the MIDI THRU port. When the Channel Voice messages arrive at the synthesizer they are rendered as musical notes. The synth ignores the SRT messages. The sync converter ignores the Channel Voice messages, but it uses the System Real Time messages to derive the Sync24 signals which it presents at its SYNC OUT port. These signals go forward to the analogue drum machine, so that it plays its internal rhythm patterns in time with the master sequencer. The MIDI connection between the Out on the synth and the In on the computer males possible the recording of tracks on the computer sequencer. The `POWER' lamp (on the front panel, next to the mains lead inlet) is lit when power is connected to the MDS. The funky `BEAT' lamp (on the front panel, next to the SYNC OUT socket) flashes on and off in time with the sync stream.The lamp is lit for the first quaver-period of every crotchet-period. It will flash four times during a normal common time (44) measure. The case of the unit is 109mm x 109mm x 40mm - the MDS is exceptionally compact, particularly when you consider that it contains an integral mains (ac) power supply, obviating the need for batteries or an external adaptor. There are versions of all our mains-powered (ac-powered) devices, such as MDS, to suit both the 110 V ac and 230 V ac power systems. The MDS info on this page is also available as an Acrobat .pdf file - size: 312K bytes.